Prescribing for a trial period: when and how? When initiating or changing the dose of a medicine, simple changes to the prescription can allow pharmacists to dispense a trial period of the medicine, e.g. two weeks, rather than the full quantity. This provides an opportunity to assess response and tolerance and if the trial is unsuccessful, it will reduce medicine wastage and safety issues associated with having unused medicines in the home. If the trial is a success, the patient can collect the remainder of their prescription at no extra dispensing cost. Unused medicines contribute not only to wastage but can also lead to problems such as confusion over which medicines should be taken, dose errors, using expired medicines, sharing with family/whānau or friends and safety risks, e.g. children accessing medicines. A strategy to improve safety, reduce medicine wastage and prevent “piles of pills” from accumulating in patients’ homes is to initially prescribe a medicine for a trial period. This might be appropriate when a new medicine is initiated or a dose is adjusted, and it is uncertain if it will be tolerated or effective in terms of the goals of treatment. Prescribers can specify a trial period for a newly initiated medicine or the first prescription following a dose alteration.2 There are several examples where initiating pharmacological treatment for a patient is a “trial and error” process, e.g. managing hypertension, depression or pain, prescribing laxatives for constipation, an emollient for dry skin or special food supplements. This can lead to medicine wastage when a 90-day supply of a new medicine is dispensed, but the dose or choice of treatment needs to be changed within a week or two. If a prescription contains multiple items, indicate the above for each item on the prescription that is intended to be dispensed as a trial. If the medicine is not dispensed stat, i.e. all-at-once, ensure that any repeats are listed on the prescription to avoid additional dispensing fees for the patient should they continue with the medicine after the trial. 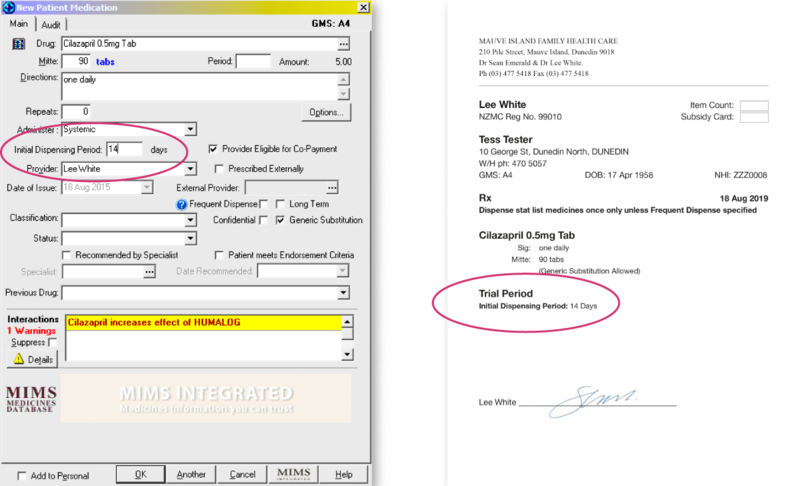 An example of how to prescribe a medicine for a trial period using Medtech* is shown in Figure 1. In the example, a patient is initiated on cilazapril, 0.5 mg, once daily. Typically, cilazapril is dispensed as a three-month stat supply; a 90-day supply is shown in Figure 1. However, patients may develop adverse effects when initiating or increasing doses of an antihypertensive which results in a change in their treatment plan, such as the development of postural hypotension in an older patient, which can place them at increased risk of falls. In the example shown, the clinician enters “14” into the “Initial Dispensing Period” field and the resulting prescription specifies that the medicine is to be dispensed initially as 14 days’ supply (14 tablets). Pharmacists can then dispense the initial quantity set out for the trial period and set up the remaining supply as a repeat. * Medtech was used for the example as it is the most commonly used patient management system (PMS) in New Zealand; if you are using a different PMS, enquire with your PMS support team if you are uncertain how to use the trial period function. When prescribing a medicine for a trial period, it is important to discuss with the patient how the outcome of the trial will be assessed, i.e. what will determine the trial to be a “success” and who will make this decision. This will vary depending on the type of medicine being prescribed and the goals of treatment. If the trial of treatment is a success, the patient can return to the pharmacy to have the remainder of the prescribed medicine dispensed; this is at no additional cost to the patient provided the medicine is fully subsidised. Best practice tip: When prescribing a medicine for a trial period, make a note of when the trial will end and schedule a follow-up phone call by a nurse at your practice to ensure that the appropriate action has been taken, i.e. the remainder of the prescription has been collected or a follow-up appointment has been made. PHARMAC. Pharmaceutical Schedule. 2018. Available from: www.pharmac.govt.nz/tools-resources/pharmaceutical-schedule/ (Accessed Dec, 2018). 28 February 2019 added information for pharmacists in the example on dispensing a trial supply. 15 February 2019 Sentence removed stating that there would be no additional dispensing fee if the remainder of the prescription was collected for a medicine that is not subsidised; this varies between pharmacies and depending on the medicine.